These warriors drawn from wealthier households of merchants, artisans, and smiths. 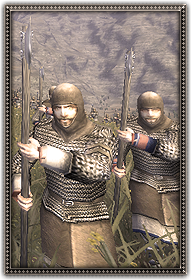 They are able to afford the vastly improved protection of light mailed armor and choose to fight with a heavy two handed axe. They make good offensive infatry but should not be relied on to hold a line.